I will share a little secret about coloring. Coloring with Caliart glitter gel pens is a great way to release stress and chronic pain. Coloring at any time of day will place you in a balanced mindset and help you transition to work or sleep. With technology taking so much of our time and focus, reconnecting with the simple things we enjoyed as children is a way to be more present and mindful. So turn off the machines and get coloring today! Are they ALL glitter? - Yes. They are all glitter . What's the tip size of these pens? - The tips are 1.00mm. Do they show up on the black paper? -Yes. All our glitter pens can show their bright color on the black and white paper. Especially the neon glitter colors. Have more question? - Ask us immediately and tell us your suggestion. First, leaving the protective caps off gel pens can lead the ink inside to dry quickly, so remember to cap them after using them. Second, some liquid may be stock due to weather(specially the winter),we can just shock it a little bit before using. 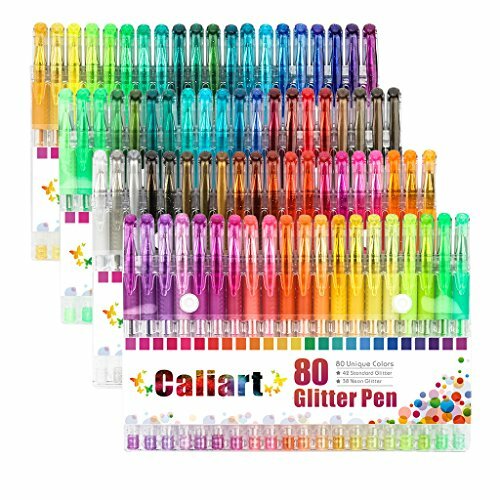 Largest Whole Glitter Set: This glitter gel pens have 80 unique vibrant colors, including 42 standard glitter and 38 neon glitter colors(white,brown for sure) so you can add sparkle to your coloring, work, art & life! PREMIUM QUALITY: All 80 pens with 1.0 mm ballpoint tips are non-toxic and acid-free. The ink is smooth flowing without any skips and does not bleed or fade. Perfect for your adult coloring books ! Comfortable Grip: Our gel pens have soft rubber grip on it. You will easily be able to continue all your projects without suffering fatigue. Now our Caliart glitter pens really let the stress go far away from us. Just try it. VARIETY OF USES: The uses is endless: sketching, doodling, mandala coloring, school projects, scrapbooking, bullet journal, adult coloring books, writing diary, memos, making greeting cards, writing party invitations, writing letters to friends and family, making decoration in all kinds of activities. With those amazing pens, your life will be full of creativity and happiness. Special Gift Package: This glitter pen set is in a fashionable paper box and looks like a book . You can carry it wherever you go and store it in a backpack, drawer, locker, or shelf. It is the best Christmas gift choice for family or friends. If you have any questions about this product by Caliart, contact us by completing and submitting the form below. If you are looking for a specif part number, please include it with your message.